The following is an edited version of a draft document on world perspectives, , that will be discussed at the January 2016 World Congress of the Committee for a Workers’ International (CWI). The meeting will be attended by comrades from 35 countries, from all continents. This document does not fully cover developments in Africa or Latin America, which will be dealt with in separate documents. The amended version of this document will be published on socialistworld.net, later in the new year. There has been a profound change in the world situation and world relations since the last Congress. This has been reflected in the continuing economic crisis, the ratcheting up of tensions between the major world powers, clashes and wars as well as intense politicisation on a world scale. The eruption of the student movement in South Africa and the defeat of the military in Myanmar are reflections of this. 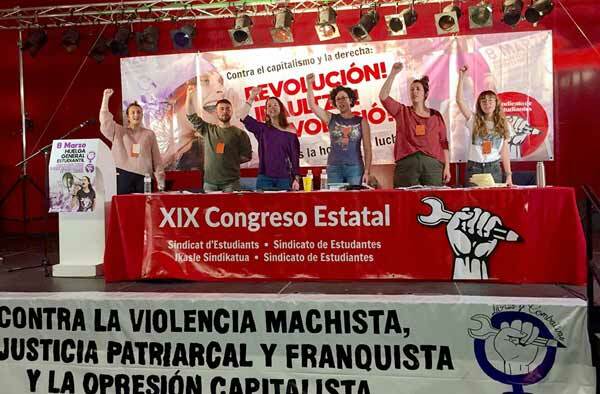 Similar movements, although not yet on the scale of Greece, have taken place in Spain and Portugal, with the recent election of a ‘left’ government in the latter, supported from the outside by the Left Bloc and the Communist Party. Italy is likely to enter a similar cycle of struggle in the next period with the re-awakening of the working class, the renewal of the trade unions and the rediscovery of the revolutionary traditions of the Italian workers. At the same time, we have seen a growth in the far right throughout Scandinavia as the number of refugees has swelled, which is the highest influx into Sweden since the Second World War. Following this was a wave of far-right violence, including arson attempts on three buildings occupied by members of Rättvisepartiet Socialisterna (RS), the Swedish section of the CWI in Gothenburg. The party is a well-known and significant organisation of the left in the city, participating in many local campaigns on housing, against cuts, prominent participants in antiracism work as well as support for the Kurdish struggle. A big class polarisation has developed throughout the US symbolised by the splendid victory in Seattle of Kshama Sawant and Socialist Alternative, political sympathisers of the CWI. This in turn has played a decisive role in laying the basis for the nationwide Bernie Sanders presidential campaign. Of course, this has been at the cost of an enormous, unsustainable debt pile which has helped to transform China from ‘rescuer’ of world capitalism to a huge threat. The neo-colonial world, dubbed the ‘emerging markets’ and the great hope for world capitalism, has become the ‘submerging’ market. They have experienced massive upheavals as a direct effect of China’s economic travails, which combined with the slashing of oil prices has severely affected whole continents and many sizeable countries: Brazil, Nigeria, South Africa and Angola. Together with the drop in oil prices, one of the consequences of the world economic slowdown, particularly in China, is the political fallout in Asia. The fate of many of the countries in the region is linked to China with the prospect for them now of economic stagnation and the political convulsions that will develop in its wake. This in turn has big political implications and opportunities for our sections in Australia – which has seen a 27 year boom, come to a juddering halt – and Malaysia, already mired in government corruption scandals and now faced with a new round of struggle. The Modi government in India, which was supposed to be firmly ensconced in power for the foreseeable future – although we rightly pointed out in the general election it only received 25% of the popular vote – has been shaken by severe electoral setbacks recently, such as in Bihar. Moreover, in some countries in the region, new opportunities will be presented to the CWI with the changed and worsening economic situation. The ‘umbrella movement’ in Hong Kong of 2014 was the biggest protest against the Chinese dictatorship since Tiananmen Square. The first elections to follow saw the ruling parties losing out often to young candidates who had participated in those events. The CWI’s contender received a magnificent one third of the votes cast in her ward, showing the enormous potential for energetic and clearly socialist campaigns to get a response. The colossal defeat of the military in the recent Myanmar general election is symbolic for the whole of the region, with rising popular discontent against the remnants of the old regime of the generals, who are completely incapable of solving the problems of the masses. Any new government which seeks to conciliate the military will fail. The workers and youth of the country have proud traditions of struggle to follow, such as the mass uprising of 1988 which lasted more than five weeks before it was drowned in blood. The latter is itself facing a much bigger crisis than in the past with the loss of oil revenue. In response, Nazarbayev has launched a massive programme of privatisation and allowed the currency to massively devalue, causing hardship for millions.All this will mean a new upsurge of mass discontent and opportunities for us if we can build a stable determined organisation in the country, which in turn can have an effect on other countries in the region that will be affected by the crisis. We see the opposite process to the post-Second World War situation today. Even before the present clashes over trade agreements, there has been the stalling of trade liberalisation efforts at Doha. The Obama regime, through the Trans-Pacific Partnership (TPP) – aiming to liberalise trade in the Pacific to the advantage mainly, of course, of US imperialism – has been for the moment thwarted by opposition amongst others from the working class and the US unions. This even compelled Hillary Clinton, who indicated earlier support for TPP, to perform a somersault and come out in opposition to it because of the need to get the US unions onside. China described the TPP as partly designed to undermine China and enhance the position of US imperialism in the Pacific as an ‘economic NATO’. The opposition of the US unions and the working class to these measures – which they see as compounding their problems – aroused resistance to US capitalism. The US unions are down to 6 million members, roughly the same number as Britain with almost six times the population. This in turn is generating a big revolt against right-wing trade union leaders who are clueless and impotent on how to build the unions. This will be a vital step in defending the working class from downwards pressure on their wages and conditions. This means a rising tide of discontent affecting more and more layers who may have previously felt that they had a stake in capitalism but are now questioning it. In a recent poll, 55% of Americans agreed with the proposition ‘the rich are getting richer’. There is a widespread perception that the rich are being bailed out by the state and that bank bailouts in the aftermath of the last crisis was ‘socialism for the rich’. There is also the potential for growth particularly in the US of socialist and Marxist ideas, reflected in Kshama’s election victory, the support for Bernie Sanders and, not least, the rapid growth of our political sympathisers in the US. The unipolar world of George Bush – with his military ‘full spectrum dominance’ – was already giving way to a multipolar world, particularly because of the rise of China, not just economically but also increasingly demonstrating its enhanced military prowess. Although Russia and now China are beginning to reassert themselves – the former in Ukraine and now its intervention in Syria – the US is still likely to be the overwhelmingly dominant military power on the globe for years. China has furiously begun to step up its military posture, particularly in the development of a ‘blue water’ naval strategy, concentrating first on the Pacific, where it vies for support and influence against US imperialism. The EU cannot compete militarily with China or the US, with the bourgeoisie of the continent preferring to largely shelter under the US military umbrella. Yet economically the combined weight of the EU is equal to or even in some reports, ahead of the US. But Britain, which is no longer really a world power, signified by its keenness to become an economic colony of China, now spends a paltry sum on ‘defence’. As the war’s toll of the dead and injured rose so did the increasing difficulties of conscripting young people into the government forces. This was aggravated by the low pay for those enlisted in the Syrian army, contrasting with the lush living of the elite who did not dirty their hands with much fighting. Isis and the other reactionary anti-Assad forces suffered no such economic difficulties. Those who joined its ranks from other countries in the region received handsome remuneration through much higher wages than the impoverished conditions ‘at home’, with access to the latest technological goods too. However, the rotten Saudi regime is paying a price for its costly interventions in regional conflicts and in seeking to maintain its leading position in the oil trade. Its decision to keep on pumping oil in order to protect its global market share is in danger of rebounding on the regime in the next period. In an upcoming meeting in Vienna of Opec, it has been indicated that it is likely to shift its position. Last year, they rocked the oil market by abandoning the traditional position of reducing supplies in order to stabilise prices. Since then, oil prices have collapsed from a $115 to below $50 a barrel with billions of dollars of investment in oil production elsewhere being put on hold. But the other side of declining oil revenues have rebounded on Saudi Arabia, which now has a budget deficit of at least 20% of GDP. This has led the government to dip into its huge reserves, which has had an effect on investment in infrastructure and squeezed government spending. This in turn sparked a private sector slow down, cuts in subsidies and the general squeezing of living standards. Taken together with the disaster of hundreds killed at the annual Hajj pilgrimage, this has resulted in unprecedented criticism of the corrupt Saudi regime. Letters in Arabic have circulated calling for the overthrow of the King and have been welcomed by wide layers of Saudis, having been read by 2 million people. This represents the wind famously ‘blowing the tops of the trees first’. Increased repression by the regime is probably a symptom of growing opposition. The removal of the more corrupt layers in the ‘kingdom’ could open the floodgates to unprecedented demonstrations, which can have a significant impact not just in Saudi Arabia but throughout the region. A new situation has opened in Iran as Obama has moved to negotiations and proposed the lifting of sanctions, although this has still to be ratified in the US Congress where it will meet opposition from hard-line Republicans. At the same time, Iran itself has intervened to back Shia forces in various conflicts in the Middle East, sometimes in opposition to the forces supported by US imperialism. Within Iran itself there are growing social tensions and some divisions within the regime. We need to be ready for major social upheavals within Iranian society in the coming period. The working class and its allies remains the key to the situation in the Middle East. The North African and Arab revolutions – particularly in Tunisia and Egypt – showed their colossal strength and the potential political power which the working class and its allies have to change the situation. However, the fallout from the splintered and disturbed state of the world has enormously complicated the situation. If the workers’ organisations had possessed a clear perspective and programme linked to a socialist vision and a leadership equal to the situation, things could have turned out entirely differently. Big opportunities have been lost because of the absence of the mass ‘subjective factor’. This was partly determined by the fact the working masses had been kept under the heel of dictatorial and authoritarian regimes in the preceding period. In Egypt, the independent trade unions played an important role in the struggle against the Mubarak regime. But they were not strong enough to impose themselves on the revolution in its early stages. Tunisia was an exception to the general pattern. The country which had seen the development of a powerful independent trade union movement, the UGTT, in the first period of the revolution when a big element of dual power existed could have played a decisive role in leading the revolution and, in the process, initiated a new mass party of the working class. This would have found a big echo throughout the region. Because of the absence of the subjective factor and the speed of events, it was not possible for the formation and crystallisation of a distinct class and socialist consciousness. In general, we have seen big but as yet unsuccessful movements of the working class. The Egyptian revolution presaged powerful movements of the working class in Europe, which has shaken the continent, particularly southern Europe – Greece, Spain, Portugal – to its foundations. This was clearly underlined in North Africa and the Middle East where the initial revolutionary wave saw US imperialism as an impotent bystander unable to intervene. Only with the ebb of the revolutionary wave – which in turn was contributed to by the weakness, virtual absence in fact, of a conscious revolutionary core able to win the masses and direct the movements – did reaction gradually take the reins of power back into their hands. They could not directly intervene in the first phase but sought a role for reaction through the back door by establishing a foothold in Bahrain, Libya, etc.